Update Pulled her out ... put the battery charger on her and she started right up. Wow Great old engine. Will need a tune up but is ready to ride. I just hate this, but having to sell one of my baby’s. 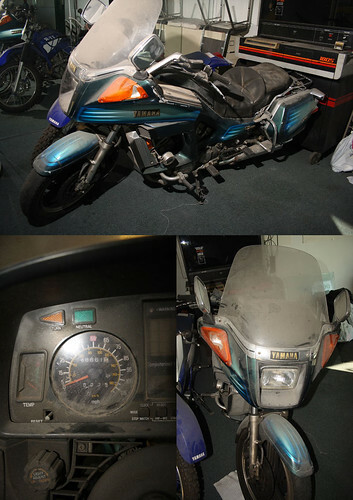 She is a 1984 Yamaha Venture XVZ12. Here she is befor moving her or washing her off. I received her in less than current condition. I rode it for 2 years and then put it in storage a year ago and have not ridden it since. (did now and she started right up and took her around the block) I have not even had the chance to knock the dust off but I did get her to startup the battery is dead and currently on the charger but with a jump she came up right to life. She was running great when she went in to storage. There are a few things I can tell you she needs. First off a bath would help, front tire should be looked at soon, the air shock seals will eventually need replacing. 2 lens covers up front for the turn signals. Some body work the plastic in some areas are cracked and need attention. There is an exaust leak on one side .. (makes it louder) and it will need either a battery or a new stator because it will not take a charge when running. At least one side of the stator is good because the bike runs great off of it I just will not stay charged. None of these items stoped me from using it daily for 2 summers. Here is a review I found .. unfortunately I lost the link last night when my laptop decided it wanted to shut down by itself. Yamaha's entry into the full-dress luxury touring market was the first motorcycle to be conceived from the beginning for the touring crowd. Rather than just adding a fairing to an existing machine, Yamaha engineers designed a total package. They succeeded very well. The Venture was extremely smooth and quiet, and was very comfortable. Yamaha claimed the seat was orthopedically designed for maximum comfort. The machine was also adjustable... the bars could be moved, the passenger pegs had three positions etc. This was a supreme attempt by Yamaha to oust the Goldwings from their perch as the most popular touring machine. Wet weight in 1984 was 771.5lb's.